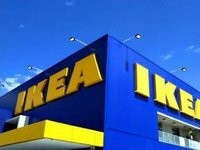 Ukrainian President Petro Poroshenko will meet on Wednesday with Stefan Vanoverbeke, CEO of IKEA Southeast Europe, to discuss the opening of a store in Ukraine. "IKEA is coming to Ukraine! Ukraine has been waiting for this news for a long time, and in the last few years there have been many changes that made the opening of IKEA in our country possible. This is a good signal for other world-known brands. One needs to deal with Ukraine," Poroshenko wrote on his Facebook page early on Wednesday.